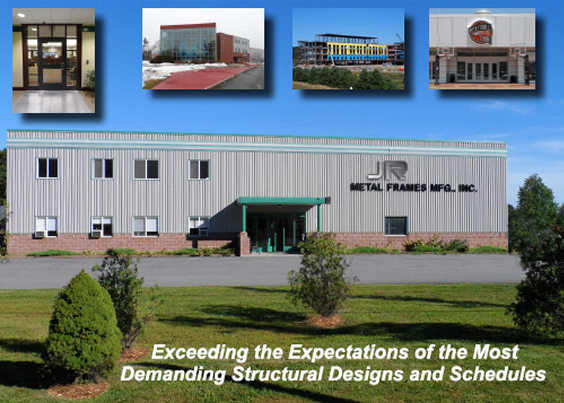 JR Metal Frames has been manufacturing quality hollow metal frames and hollow metal doors since 1981. Our core belief to provide superior hollow metal craftsmanship in custom designing our metal frames and steel doors has been the cornerstone of our success. Each customer speaks with a real person and can rely on our old fashioned hands-on approach. From the owner on down, we deliver caring attention to detail, dependable on time delivery, custom manufacturing to exact supplied detail, and a welcoming staff that ensures your JR transaction will be satisfying. We manufacture the following frames with American steel: nailer, no return, split, center glaze, reveal, shadow, side lite, knock down, transom, borrowed lite, lead lined, segmented, communicating, hospital stop, removable transom, kerfed, adjustable jamb, thermal break, double egress, open case, single rabbet, equal rabbet, unequal rabbet, curved top, pocket, mullion, arch top, radius, and custom welded with any hinge locations, lock or strike preps, and fire rated if possible up to 3 hours. Our steel doors are built with honeycomb, polystyrene, thermal fiber, and polyurethane cores. They can be lead lined, steel stiffened, and fire rated up to 3 hours with any hinge location and custom lock or strike prep. JR ships direct to distributor warehouses, commercial job sites, schools, government buildings, metal housing projects, and new construction sites across the United States and Canada. Questions or odd sizes? We build anything imaginable from hollow metal and can assist with your project specifications. In a jam - Our quick ship program has next day service when you need us the most. JR Metal Frames appreciates your business and understands there are choices when placing hollow metal orders. Our whole team takes pride that you've selected JR Metal Frames to manufacture your hollow metal project. We are committed to servicing our distributor partners in the quickest, most efficient manner possible.